How to: Apply Foundation – I Heart Hair, Inc. 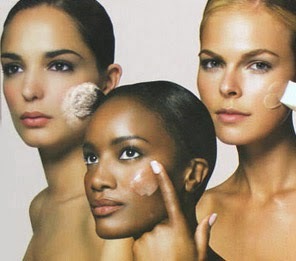 The right foundation will even out your skin tone and give you the appearance of flawless skin. But you have to do it right, otherwise you risk looking like a clown! Follow these steps for a flawless complexion. *Test foundation on your jawline and check it in the daylight. The color is correct if it disappears without blending. *For the perfect canvas, make sure your skin is clean and moisturized. Wait five minutes before you apply foundation to let moisturizer sink in. *If you want just a little coverage, use your fingers. For more coverage, use a sponge. The Beauty-blender Cosmetic Sponge is a favorite among pros: It leaves just the right amount on the skin. *Luminous Powder: New translucent powders reflect the light help skin glow and take down shine. Dust one in a W motion. Starting at your hairline on one side, swoop down to your cheekbone, up to the bridge of your nose, back down the other cheek, then up again to the opposite hairline.